The sordid sequence of events that opened the floodgates for the genetic takeover of the American food supply — that is, the mass introduction of untested genetically-engineered (GE) food ingredients on the sly — is outlined in an eye-opening new book by American public interest lawyer Steve Druker, entitled Altered Genes, Twisted Truth. Drudging up several decades’ worth of historical facts surrounding genetically-modified organisms (GMOs) and the way biotechnology companies got them onto the market without proper testing, Druker tells the true story about “Frankenfood” that you’ll never hear about on any of the major corporate new networks. From the very beginning, GMOs came to be a thing not because they are superior or safe, but because powerful interests got them there illicitly. In the book’s foreword, award-winning humanitarian and leading primate expert Dr. Jane Goodall lauds Druker for bringing to light a number of important truths about GMOs, including that they have never undergone appropriate safety testing; have never been shown to be safe for human consumption; and were not even approved in accordance with federal law. When they were first being developed back in the early 1980s, GMOs were hailed as the solution to world hunger. Their proponents argued, and still do, that conventional and organic food crops are inferior, and that GMOs address the problems of drought and pestilence that lead to reduced yields, and in some cases food shortages. But the science behind these claims is lacking, and many scientists and researchers at the U.S. Food and Drug Administration (FDA) who were tasked with reviewing GMO safety and effectiveness prior to their commercial approval vocalized this. As explained in Druker’s book, the concerns of these FDA scientists were largely ignored, and GMOs were rammed through the system illegally. “[I]nformation that Druker pried from the agency’s files through a lawsuit revealed that [the agency] apparently ignored (and covered up) the concerns of its own scientists and then violated a federal statute and its own regulations by permitting GE foods to be marketed without any testing whatsoever,” writes Dr. Goodall. Another popular, but unsubstantiated, claim about GMOs is that they are substantially equivalent to their non-GMO counterparts (except when it comes to patent protection; in this case, GMOs are regarded as substantially different in order to accommodate obscene corporate profits). As explained in the book, biotech companies have intentionally misled the public on the differences between artificial genetic engineering and cross-breeding, resulting in mass confusion. 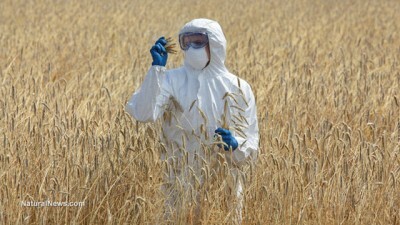 GMO skeptics aren’t anti-science — the biotechnology industry is! In its most recent issue, National Geographic magazine brazenly asserted that anyone who questions the safety or benefits of GMOs is “anti-science.” The mainstream media and government health authorities are constantly throwing around this buzzword in an attempt to silence anyone who opposes the golden calves of modern society, whether they be GMOs or things like pharmaceuticals, vaccines, and fluoride. If you take the time to investigate the supposed “science” backing GMOs, you will quickly realize that none of it holds any water. Nearly every published study that supposedly backs the safety of GMOs, in fact, can be directly traced back to the industries pushing GMOs. Evidence of long-term GMO safety is non-existent, and the only trials conducted for longer than 90 days were pioneered by independent scientists, many of whom have reported serious risks associated with GMOs. “Contrary to the assertions of its proponents, the massive enterprise to reconfigure the genetic core of the world’s food supply is not based on sound science but on the systematic subversion of science — and it would collapse if subjected to an open airing of the facts,” maintains Druker about this highly corrupt industry. Druker’s book is an evidence-based goldmine that counters all the prevailing myths about GMO safety using actual science. Contrary to what the “experts” often claim, altering plant organisms with foreign genes and toxic bacteria is an imprecise “science” (if you can even call it science), and the risks of this largely undefined technology are vast. And to make matters worse, the spread of GMOs is continuing all around the world, even in places like Europe where GMOs are largely banned. The so-called “Transatlantic Trade and Investment Partnership”, or TTIP, for instance, threatens to bypass European law by creating a special trade partnership between Europe and North America. According to The Centre for Research on Globalization, one of the key points in the ongoing TTIP negotiation process (which is largely taking place in secret, without public scrutiny) involves reducing the existing barriers that prohibit North American grains and other foodstuffs (many of which are GMO) from being exported to Europe. “TTIP is an attempted corporate coup d’etat where big business on both sides of the Atlantic is trying to achieve in secret negotiations what it could not get in open and democratic processes — from watering down food safety standards to rolling back regulations in the financial sector,” reads a cited quote by Pia Eberhardt from the lobby-watchdog group Corporate Europe Observancy.